There is light at the end, but today I pray for wide-angle vision. I don't want to waste it away -- the time -- on waiting to live fully only in the fullness of light. I want to see, live nestled inside these moments with little boys who only want to snuggle their mommy and serve her pretend sparkling wine from the restaurant of imagination. I don't want to lose it to the darkness of anxiety-laced thoughts about MRIs and ENTs and MDs and whatever follows those letters and their diagnosis. I cry-pray rest enough to unclench white knuckles from clinging to my life. I cry-pray hot tears, sink my hands into the low back of a black kitchen chair and feel two small arms wrap around my thigh, a head press against the side of my hip. I weep quietly for a few moments and usher out breath from my shaking lungs, squeezing tightly the shoulders of my oldest son. I won't go to the places where I'm drowning deep in the waters of picturing his life, his brother's life, his father's life if the what-ifs were to unfold. I stand my ground against diving into the waters and then force jelly-like legs to move into the wide-angle frame of life outside the tunnel in which I'm standing. He follows me around the house, stays close enough in his play that he could dive in after me if I jump. At not even five, he thinks he's lifeguard to my wild-toddler-at-the-shore moments. my back to the ocean face toward the Sun glowing in the horizon of tall grasses and little boys and a strong-heart husband and this life-gift spread out before my eyes. This piece was inspired by the Bigger Picture Blogs Writing Circles prompt "awakening" in the Life-Out Loud genre. It was edited after critique from fellow writers. 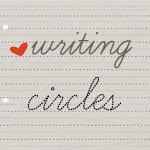 Join a Writing Circle and take part in the writing process at a whole new level! A few friends have said I was too vague in this post and asked for explanation to the MRI references. I've had some lingering head pressure issues we thought were stemming from sinuses ... but my sinuses are clear. A specialist suggested doing an MRI to see if we can find what's causing the pressure. It's probably bothing but as someone who battles anxiety, the unknown can grow if I let it. Honey... what is going on? Oh, I hope everything's okay. Thanks for that bit of explanation at the end. I'm praying for you, Hy.